Abstract — We undertook a telephone survey to examine perceived stress among 165 veterans with spinal cord injury (SCI) who received care from a Department of Veterans Affairs Medical Center. Measures included Perceived Stress Scale, Hassles Scale, Center for Epidemiologic Studies Depression Scale, Short-Form State-Trait Anxiety Inventory, Satisfaction with Life Scale, and Short-Form Interpersonal Support Evaluation List. The mean perceived stress score for our sample of veterans with SCI (17.3) was higher than the means for men from the general population (12.1) and nonveteran men with SCI (13.9). Physical abilities, health, and financial issues were frequently reported hassles. Stress was related positively to depressive symptomatology and anxiety and negatively to life satisfaction. The association of hassles with measures of psychological well-being was partially mediated by perceived stress. The association of perceived stress with depression and anxiety varied as a function of social support, suggesting that those with low social support are the most vulnerable to the negative impact of stress on their psychological well-being. Stress management programs designed specifically to meet the needs of veterans with SCI are needed. Key words: anxiety, depression, hassles, life satisfaction, male, psychological stress, respirator, social support, spinal cord injuries, veterans. Abbreviations: ANOVA = analysis of variance, ASIA = American Spinal Injury Association, CES-D = Center for Epidemiologic Studies Depression, MS = multiple sclerosis, PSS = Perceived Stress Scale, SCI = spinal cord injury, SD = standard deviation, SF-ISEL = Short-Form Interpersonal Support Evaluation List, SF-STAI = Short-Form State-Trait Anxiety Inventory, SWLS = Satisfaction with Life Scale, VA = Department of Veterans Affairs. This material was based on work supported by the Department of Veterans Affairs, Veterans Health Administration, Rehabilitation Research and Development Service, grant B2573R. Psychological stress has long been found to be related to psychological and physical well-being. Stress has commonly been viewed as a noxious external event or stimuli that impinges on the individual [1-2]. Researchers have examined major life events as well as more minor everyday events or stressors, sometimes referred to as daily hassles or chronic strains . Most researchers now agree that these everyday strains tend to have a greater negative effect on psychological well-being than do more acute stressful life events . Pearlin and colleagues have argued that these daily hassles or life strains have such negative effects because they are so persistent and unrelenting . Lazarus and Folkman have argued that describing a person's level of stress based solely as a function of external events (major or minor) is inadequate because it does not adequately consider the individual and the individual's appraisals . Lazarus et al. have suggested that psychological stress reflects the person's appraisal that a situation or environment is taxing, exceeds his or her resources to cope, and endangers well-being [1,6]. Cohen and colleagues argued that a global assessment of stress is more likely to predict the impact of stress on health and well-being than measures of specific major or minor life events . Specific events and stressors are anticipated to contribute to the overall global assessment of stress; thus external stressors (major life events, minor life events, and daily hassles/strain) would all contribute to higher global perceived stress scores, which would, in turn, affect psychological and physical health. Turner and Wood postulated that having a chronic physical disability is a chronic life strain . They found that measures of chronic impairment-related strain were significantly related to depression. Consistent with Turner and Wood's hypothesis, Cohen and Williamson reported higher global perceived stress scores in persons who were disabled than in persons in the general population . In the past two decades, psychological stress research has been extended to persons with spinal cord injury (SCI). Stress may have important clinical ramifications for persons with SCI, given the literature linking stress to immune function and wound healing  and given research suggesting that persons with SCI are more likely to have impaired immune systems than the general population [11-18]. Earliest efforts to examine stress in persons with SCI assessed stressful life events and their effect on psychological well-being [19-20]. Rintala et al. studied global perceived stress in community-residing persons with SCI and found that persons with SCI had greater perceived stress than their counterparts in the general population and that higher perceived stress was associated with more depressive symptomatology, less satisfaction with life, and poorer self-assessed health [21-22]. Gerhart et al. similarly found greater perceived stress to be related to more depressive symptoms, less life satisfaction, and poorer perceived well-being among British individuals who had lived with SCI for at least 20 years . Although causality cannot be inferred from these cross-sectional studies, clearly perceived stress is correlated with poorer health and psychological well-being. Rintala et al. also found that social support was related to overall perceived stress scores in persons with SCI [21-22]. Among men with SCI, those who were more socially integrated and more satisfied with their social support reported lower levels of stress. Social support also has been related to a number of health outcomes, including psychological health, physical health, and even mortality [24-26]. While some studies have suggested that social support has a strong and direct effect on psychological and physical health outcomes, others have found support for the stress buffering model, which proposes that social support acts as a buffer against the negative consequences of high levels of stress . In this study, we were interested in examining the effect of daily hassles and global perceived stress on psychological health outcomes. We also were interested in examining the direct and/or stress-buffering role of social support. Our population of interest was veterans with SCI who receive healthcare from Department of Veterans Affairs (VA) facilities. We were already aware from the literature that persons with SCI had higher average perceived stress scores than the general population. We further anticipated that veterans with SCI might even be at greater risk of experiencing more frequent daily hassles and higher levels of global perceived stress. Evidence suggests that veterans compared to nonveterans are more likely to have psychiatric disorders , to be homeless , to smoke [30-31], and to be heavy drinkers [32-34]. Furthermore, veterans who receive at least some of their healthcare from a VA facility have been found to be socioeconomically disadvantaged and to have poorer health status than veterans who receive all of their care elsewhere . Many of these differences between veterans and nonveterans and between veterans who receive healthcare at VA facilities and those who do not are factors that have been shown to be related to psychological stress . A large study compared elderly men treated for acute myocardial infarction at VA hospitals with men on Medicare treated at non-VA hospitals. Those treated in VA hospitals were more likely to have a number of coexisting conditions including hypertension, chronic obstructive pulmonary disease or asthma, and diabetes , all of which can be related to or exacerbated by stress [37-40]. Thus, one could argue that veterans, in general, particularly those who seek healthcare from VA facilities, may be at greater risk for high levels of stress and for the negative consequences of stress. Given (1) the very serious health concerns of veterans with SCI, including secondary conditions such as urinary tract infections and pressure ulcers; (2) the literature demonstrating the negative effects of stress on health, including immune function and wound healing; (3) the poorer immune function of persons with SCI; and (4) the unique characteristics of veterans receiving care from VA facilities, a better understanding of the nature, sources, and experience of stress among veterans with SCI is warranted. To our knowledge, no studies of subjective stress have been done in veterans with SCI. This study attempts to fill this gap in the literature by examining stress and its correlates in veterans with SCI. 1. Veterans with SCI will perceive more stress than the general population and more stress than a sample of nonveterans with SCI. 2. Veterans reporting more daily hassles will have more subjective stress than those reporting fewer hassles, and the relation of hassles to psychological well-being will be mediated through perceived stress. 3. In addition to having a direct effect on psychological well-being, social support will moderate the effect of stress on psychological well-being. In other words, the relation between stress and psychological well-being will be greater among veterans with lower social support. Our proposed model is displayed in Figure 1 with the effect of specific sources of stress (daily hassles) on psychological well-being mediated by one's overall global perception of stress. The model also depicts both the direct influence of social support on psychological well-being as well as its moderating role on the impact of stress on psychological well-being. Within the 2 years before the beginning of the study, 495 veterans with SCI received healthcare services at the Michael E. DeBakey VA Medical Center in Houston, Texas. These individuals constituted our sampling frame. Potential participants were randomly selected from the sampling frame until 170 veterans with SCI (~34% of the total sampling frame) had participated. We made at least six attempts to contact potential participants by telephone at various times of day over several weeks, if we had a working telephone number. In some cases, no current telephone number was identified through VA records or Internet searches. Before abandoning the recruitment of persons who we were unable to reach by telephone and moving down the randomized list, we sent letters to the last known address asking the potential participant to call a member of the research staff using a toll-free number. If the person did not respond within 2 to 3 weeks, the next name was selected. To be included, participants had to be at least 18 years of age, have an SCI, have sustained the SCI at least 6 months before study entry, be able to provide self-report information by telephone, be living in the community (i.e., not be hospitalized), and be willing to participate. We randomly selected 378 persons from the sampling frame to complete the desired number of surveys. Of the 378 persons randomly selected from the sampling frame, 26 (6.9%) were deceased, 105 (27.8%) were unable to be contacted, 62 (16.4%) refused to participate, 6 (1.6%) asked to be called back later but did not consent before the end of the study, 4 (1.1%) were reported by family members to be mentally incapacitated, 1 (0.3%) stated he was too depressed to participate, 1 (0.3%) indicated he was unable to participate because he was ventilator-dependent, and 3 (0.8%) withdrew partway through the survey. Thus, the participation rate was 45 percent (170 of the 378 randomly selected). The 208 nonparticipants and the 170 participants did not significantly differ on variables available from the VA electronic medical record, including age, age at onset of SCI, time since onset of SCI, gender, race/ethnicity, and level and completeness of injury. To obtain a more homogeneous sample for all analyses reported here, we excluded the two women participants and the three participants who could not be categorized by level and completeness of injury, one who had cervical spondylosis, one who had central cord syndrome, and one who had multiple sclerosis (MS). Thus, the analyses included 165 male veterans with SCI. The characteristics of the respondents, including the level and completeness of injury, are described in Table 1. Characteristics of the sample, subjective stress, sources of stress, and psychological well-being. *Participants who did not report income were not included in the analysis of variance for stress by income. ASIA A, B, C, D = American Spinal Injury Association Impairment Scale grades A, B, C, and D.
We sent potential participants a letter explaining the study and a set of cards with response options for particular questions. After approximately 2 weeks, they were contacted by telephone and invited to participate. If we could not reach participants by telephone, we sent a second letter to the last known address asking them to contact the research staff. Once contacted by telephone, the veterans were given an explanation of the study and asked if they wished to participate. Those interested in participating gave oral consent on the telephone. The Baylor College of Medicine Institutional Review Board for Human Subjects Research approved this procedure for recruitment. After giving oral consent, participants either began the telephone survey or made an appointment to complete the survey at a later time. Veterans who agreed to participate were asked about subjective stress, sources of stress, and other factors potentially related to stress (e.g., social support, depression, anxiety, and life satisfaction). The survey took approximately 60 to 90 minutes to complete. We conducted the interview in more than one session if the veteran became fatigued or needed to end the interview before completing all measures. Veterans were paid $25 for their participation in the survey. We obtained information related to the veteran's level and completeness of injury and time since injury from medical records. Basic demographic information (e.g., age, education, race, marital status, employment status, income level) was collected during the telephone interview. The Perceived Stress Scale (PSS)  assesses the extent to which respondents have felt their life to be stressful (i.e., unpredictable, uncontrollable, and overloading) during the past month. They rate themselves on the 10-item measure using a 5-point scale (0 = never to 4 = very often) with possible scores ranging from 0 to 40. The scale has been reported to have good internal consistency and has demonstrated moderate correlations with other measures of appraised stress . Gerhart and colleagues found that the 14-item version of the PSS administered to persons with SCI was negatively correlated with measures of life satisfaction and quality of life and positively related to depression and fatigue , thus supporting the validity of the measure for use in the SCI population. Similarly, Rintala et al. reported that the 10-item PSS was positively related to stressful life events and negatively related to social support in a sample of men with SCI . In the present study, Cronbach's alpha was 0.86. The Hassles Scale is a 53-item measure that assesses relatively minor stressors encountered in daily life . We asked respondents to indicate how much of a hassle, annoyance, or bother each item had been in the past month using a 4-point scale ranging from 0 to 3 (none or not applicable, somewhat, quite a bit, and a great deal). The Hassles Scale has been used with persons with SCI, fibrositis/fibromyalgia syndrome, rheumatoid arthritis, and chronic tension-type headaches [21,41-42]. One study reported good mean test-retest correlation coefficients for each monthly administration with the following month over a 6-month period . In the present study, we were interested in using the Hassles Scale as a more objective measure to identify sources of stress among veterans with SCI in contrast to the PSS, which was used to assess global perceptions of the stressfulness of their current lives. Therefore, instead of using the sum of the ratings on the Hassles Scale, we chose to use the score reflecting the total number of hassles endorsed (i.e., any items rated at least somewhat of a hassle). In the present study, Cronbach's alpha was 0.90. The Center for Epidemiologic Studies Depression (CES-D) Scale is a 20-item self-report measure of depression . Each of the 20 items is rated on a scale ranging from 0 (rarely or none of the time) to 3 (most or all of the time) according to how often the person experienced certain feelings during the past week. Possible scores range from 0 to 60, with higher scores indicating more depressive symptomatology. The CES-D Scale has been used successfully in several studies of persons with SCI [44-48]. Strong evidence of convergent and discriminant validity and internal consistency has been reported for the CES-D Scale [43,49]. In the present study, Cronbach's alpha was 0.90. The Short-Form State-Trait Anxiety Inventory (SF-STAI) , a six-item version of the Spielberger STAI , assesses state anxiety. Respondents indicate the extent to which they currently feel calm, tense, upset, relaxed, content, and worried, using a 4-point response scale ranging from 1 (not at all) to 4 (very much). The calm, relaxed, and content items are reverse-scored so that higher scores on all items reflect greater anxiety. Possible scores on the measure range from 6 to 24. The long form of the STAI has been administered to persons with (1) musculoskeletal pain with or without fibromyalgia, (2) traumatic brain injury, and (3) serious orthopedic injuries [52-53]. The short form has been reported to be highly correlated with the total score on the STAI, and acceptable reliability and validity have been reported . In the present study, Cronbach's alpha was 0.88. The Satisfaction with Life Scale (SWLS)  is a five-item scale measuring global life satisfaction. It has seven response options ranging from "Strongly Disagree" to "Strongly Agree" to indicate agreement with each of five statements regarding satisfaction with life. The SWLS has been used in a number of studies of persons with SCI [55-57]. It has been found to have a moderately high correlation with the Life Satisfaction Index-A  and with other measures of well-being, lending support to the scale's convergent validity. Pavot et al. reported that the SWLS had good internal consistency . In the present study, Cronbach's alpha was 0.81. The Short-Form Interpersonal Support Evaluation List (SF-ISEL) is a six-item instrument that measures perceived social support. Respondents use a 4-point response scale (Definitely True, Probably True, Probably False, and Definitely False) to indicate the extent to which people are available to provide support to them in a variety of areas. This brief scale includes two items each from the tangible, belonging, and appraisal support factors of the original 40-item ISEL measure . The six-item scale has been used previously with middle-aged and older adults, including women with breast cancer [61-63], and has been reported to have acceptable internal consistency. The long form of the ISEL has been used with persons with SCI and ankylosing spondylitis [21,64]. In the present study, Cronbach's alpha was 0.77. Descriptive data were obtained for all study variables, including means, standard deviations [SDs], and ranges for continuous variables and number and percent for categorical variables. Scores for the scales were calculated, as was the total number of hassles. We assessed the relation between subjective stress, as measured by the PSS, and categorical variables using analyses of variance (ANOVAs) and assessed the intercorrelations of all continuous study variables using Pearson correlations. To examine the first hypothesis, we compared the mean score for the PSS to mean scores on the scale for (1) the general population  and (2) a community-based sample of nonveteran men with SCI  using an ANOVA, followed by post hoc pairwise comparisons (Bonferroni method) of our veteran sample with each of the other two samples. The second hypothesis proposed that the effect of daily hassles on psychological well-being will be mediated through global perceived stress. We conducted three separate series of multiple regression analyses (one for each measure of psychological well-being). As suggested by Baron and Kenny , for one to determine mediation (e.g., that global perceived stress mediates the relation between daily hassles and psychological well-being), several associations among the variables must exist. 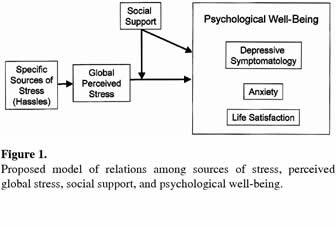 First, global perceived stress (the mediator) must show a significant association with psychological well-being. Second, daily hassles must show a significant association with global perceived stress. Finally, when both daily hassles and global perceived stress are placed in the same model predicting psychological well-being, the association between daily hassles and psychological well-being must be diminished (partial mediation) or eliminated (total mediation). We conducted multiple regression analyses to evaluate each step just outlined for each of the three measures of psychological well-being. We conducted three additional multiple regression analyses to test the third hypothesis that social support may moderate the effect of stress on psychological well-being. Stress, social support, and their interaction term (social support × perceived stress) were entered into each of these regression analyses. A significant interaction term would indicate that the relation of stress to well-being varied by the level of social support. To understand the nature and direction of this relation, we calculated the correlation between stress and each of the measures of psychological well-being separately for those reporting high and low levels of social support (those scoring in the top quarter compared to those scoring in the bottom quarter on the social support measure). We performed the Χ2 test for homogeneity of two or more correlations using Fisher's Ζ' -transformation for each of the measures of psychological well-being. Rintala et al. reported a mean PSS score of 14.1 for a random sample of 89 men with SCI living in the community . Of those men, 20 percent were veterans (n = 18). The data were reanalyzed without the 18 veterans. An ANOVA performed to compare the means for our current veteran sample, the 71 nonveterans in the previous study, and Cohen and Williamson's  general population sample of men (mean age 42.8) found significant differences among the three groups (F2, 1159 = 26.88, p < 0.001) (Table 2). Post hoc pairwise comparisons of our veteran sample with each of the other two samples revealed that the veterans had a significantly higher mean PSS score than (1) the nonveteran SCI sample (t = 2.83, p < 0.05) and (2) the general population sample (t = 7.27, p < 0.001). These findings support our first hypothesis. Comparison of mean Perceived Stress Scale scores with previous samples. Veterans endorsed an average of 14.7 hassles (Table 1). Interestingly, although veterans with SCI reported higher levels of stress than the community sample of 71 nonveteran men with SCI, they, on average, reported significantly fewer hassles (14.7 [SD = 9.1] vs. 20.4 [SD = 10.9], t = 4.73, p < 0.001), which, in part, may be a function of some of the differences between the two samples. The veterans were significantly older than the nonveterans in the community sample (mean years = 55.0 [SD = 12.3] vs. 38.3 [SD = 11.0], t = 9.87, p < 0.001). They also were more likely to have motor- incomplete injuries (American Spinal Injury Association [ASIA] Impairment Scale grade D; 24.2% vs. 7.0%) and less likely to have motor-complete tetraplegia (ASIA Impairment Scale grades A, B, or C; 30.9% vs. 50.7%, Χ2= 13.1, p < 0.001). However, neither age nor level and completeness of injury was significantly related to perceived stress or the number of hassles in either the current sample of veterans or the nonveteran community sample. The hassles endorsed most frequently by our sample of veterans with SCI included "Your physical abilities" (endorsed by 70%), "Your health" (62%), "Money for extras" (59%), "Money for emergencies" (57%), "Money for necessities" (56%), and "Your medical care" (56%). Perceived stress was unrelated to the demographic categorical variables of race/ethnicity, education, income, and marital status (Table 1). Stress was also unrelated to the impairment-related variable of level and completeness of injury. However, the eight people who used a respirator had significantly higher stress scores than those who did not use a respirator (Table 1). The intercorrelations among all continuous study variables are displayed in Table 3. Age, age at onset, and time since onset were all significantly correlated with each other (r = 0.35-0.60). However, these three chronological variables were unrelated to our three measures of psychological well-being (depressive symptomatology, anxiety, and life satisfaction). Age at onset was weakly (r = -0.16), but significantly (p < 0.05), related to stress, indicating that persons injured at a younger age were somewhat more likely to have higher stress. We found no other significant associations between the chronological variables and our predictors of psychological well-being (daily hassles, stress, and social support). The intercorrelations among the psychosocial variables varied widely from 0.29 to 0.80, all of which were significant at the 0.001 level. Pearson correlations among continuous study variables. To examine our second hypothesis that the effect of hassles was mediated through global perceived stress, we first examined our correlation matrix to determine if the preliminary conditions for establishing mediation were met. The number of daily hassles endorsed was significantly related to all three psychological health measures (r = 0.51, 0.51, and -0.44 for depression, anxiety, and life satisfaction, respectively). Perceived stress was similarly significantly related to all three measures (r = 0.68, 0.68, and -0.57 for depression, anxiety, and life satisfaction, respectively). The number of hassles was also significantly related to perceived stress (r = 0.49). Thus, we proceeded to examine whether including both hassles and stress in our regression model would diminish or eliminate the effect of hassles on psychological well-being measures. Displayed in Table 4 are the results of these analyses. In all three analyses, the strength of the association between the number of hassles and psychological well-being was reduced when perceived stress was added to the regression model. However, with all three measures of well-being, daily hassles continued to contribute significantly and independently to the explained variance, suggesting that the effect of daily hassles on psychological well-being is only partially mediated by global perceived stress. Note that depression scores exceeding 16 on the CES-D Scale indicated that a large proportion (45%) of veterans with SCI were experiencing considerable depressive symptomatology. Regressing psychological well-being on number of hassles and perceived stress. To examine our third hypothesis that the effect of stress on psychological well-being is moderated by social support, we conducted a series of regression analyses in which we entered stress, social support, and the interaction of stress and social support (Table 5). In analyses of life satisfaction, only social support accounted for significant proportions of the variance in life satisfaction. The results suggest that social support had a significant direct effect on life satisfaction. Stress did not contribute uniquely to life satisfaction, and life satisfaction was not a function of the interaction of stress and social support. In our analyses of depression and anxiety, both stress and the interaction of stress and social support explained significant variance. These data indicate that stress is not uniformly related to depression and anxiety, rather the strength of the relation varies as a function of social support. Regressing psychological well-being on perceived stress, social support, and their interaction. To better understand the direction and nature of this finding, we split our sample into three groups (approximating the lowest quartile, the highest quartile, and the 50% in between) based on their scores on the social support measure (ISEL). The bottom group had scores ranging from 6 to 17 out of a possible 24 points and consisted of 42 participants (25.5%). The top group had the maximum number of points (i.e., 24) and consisted of 44 (26.7%) participants. The middle group included 79 people (47.8%) who had scores on the ISEL between 18 and 23. We then compared the correlation between stress and each measure of well-being for the group with the lowest social support scores to the correlations for the group who had the highest social support scores (Figures 2, 3, and 4). For both depression and anxiety, the correlation with stress was stronger for those with low social support (r = 0.73 and 0.76, respectively) compared with those with high social support (r = 0.58 and 0.60, respectively); however, given the relatively small size of these subsamples, the differences in the correlation coefficients between the high and low social support groups were not significant (depression: Χ2 = 1.42, p < 0.25; anxiety: Χ2 = 1.84, p < 0.20). The correlations for the low and high groups for satisfaction with life were more similar to each other than were the other two measures of psychological well-being (low: r = - 0.56; high: r = -0.46, Χ2= 0.37, p < 0.70), confirming that life satisfaction was not a function of the interaction of stress and social support. This is the first study to show that veterans with SCI who receive healthcare at a VA healthcare facility are at increased risk for psychological stress compared with nonveterans with SCI and with the general population. Although several studies of posttraumatic stress disorder (PTSD) among veterans with SCI have been conducted [66-70], we are aware of no studies that have examined global perceived stress and daily hassles experienced by veterans with SCI. We also found that a high percentage of the sample appeared to be experiencing significant depressive symptoms, with nearly half exceeding the established cutoff of 16 on the CES-D Scale. The veterans with SCI in our sample reported a wide array of daily hassles, but the most frequently reported hassles pertained to their SCI, health, and finances. The number of hassles was positively related to perceived stress, positively related to anxiety and depression, and negatively related to life satisfaction. The effect of hassles on psychological well-being was only partially mediated by global perceived stress, with daily hassles continuing to contribute uniquely to the variance of depression, anxiety, and life satisfaction, supporting Pearlin and colleagues' assertion that chronic strain has a direct effect on psychological well-being . Perceived stress was not significantly related to demographic and disability-related variables except for an association with use of a respirator; however, stress was strongly and significantly related to a number of important psychosocial variables. Stress was positively correlated with depressive symptomatology and anxiety and negatively correlated with satisfaction with life and perceived social support. Social support significantly moderated the associations between global stress and two of the psychological well-being variables-depressive symptomatology and anxiety, thus suggesting that stress may have more negative consequences for those with lower levels of social support. Social support did not have a significant direct effect on these psychological outcomes when incorporated in a model with stress. Results with life satisfaction, however, were quite different from those results with depression and anxiety. Social support had a significant direct effect, but not a stress-buffering effect, on life satisfaction. Thus, the effect of stress on life satisfaction did not appear to vary as a function of social support. Although the stress and coping literature has generally found support for both the direct and stress-buffering role of social support, with results differing, in part, based on the type of social support measured , a recent study examining adjustment to a physically disabling chronic condition (MS), found little evidence of the role of social support in adjustment to MS. It found only limited support for a stress-buffering role of social support and no direct effect of social support . In contrast to this finding, we found in our study of veterans with a physically disabling condition that social support is highly related to psychological well-being. Interestingly, the role that social support plays appeared to vary as a function of the outcome examined. Most striking is the strength of the relation between perceived social support and life satisfaction, which appears to be significantly more robust than the relation between perceived social support and measures of psychological distress. These findings highlight the need for further research studies to examine and contrast the role of stress and social support as they relate to positive outcomes (e.g., life satisfaction) as well as to negative outcomes (e.g., depression and anxiety) among persons with disabilities. This study has several limitations. First, the two female participants were excluded from the analyses reported here. Although they represented 25 percent of the women in the sampling frame, the number was insufficient to allow analyses of gender differences. This is a problem whenever veterans with SCI are the target population of a research study because of the small number of women veterans with SCI who receive care from VA healthcare facilities. Second, participants randomly selected had a 45 percent response rate. However, no significant difference was found in available demographic and injury-related variables between persons who were selected but did not participate and persons who did participate. Unfortunately, no other information that might affect stress was available about the nonparticipants. Third, the only available nonveteran sample with SCI with which our veteran data could be compared directly (i.e., used the same measures) was significantly different in terms of age and level and completeness of injury. Fourth, an interviewer previously unknown to the participants obtained all the self-report data via a telephone survey. The impact of this method of data collection on recruitment and on the results is unknown. Fifth, although our model (Figure 1) indicates the hypothesized direction of influence from one construct to another, because this study is cross-sectional in design, causality cannot be determined. Veterans with SCI in this study perceived more stress than did the general population of men and a sample of nonveteran men with SCI. These data substantiate the need to identify and alleviate stress among veterans with SCI. Our data also suggest that a high percentage of veterans with SCI are experiencing significant depressive symptomatology. Given these findings, designing stress management programs and depression self-management programs and making them widely available for veterans with SCI may be beneficial. Because some stress management strategies may be difficult or impossible for persons with SCI to practice, stress management programs need to be developed that meet their special needs. A wide range of strategies is available that one can use for effective stress management. Martin Ginis et al. found that an exercise program developed for people with SCI improved perceived quality of life and depression. The effects of the exercise intervention on psychological outcomes were found to be mediated, in part, by reductions in perceived stress. Certain components of stress management programs, such as encouraging participants to better activate, interact with, and enhance their support networks, are likely to be appropriate for all participants regardless of level of impairment. Our results suggest that social support may be an important component to include in such stress management programs. Veterans with SCI most frequently endorsed the hassles related to money, physical abilities, health, and healthcare. The Veterans Health Administration is positioned to help alleviate hassles related to health and healthcare. Issues related to financial concerns may be more difficult to address. Even if solutions to these hassles are challenging, healthcare personnel providing services to veterans with SCI need to be aware of the hassles and chronic strains affecting their everyday lives. 1. Lazarus RS, Folkman S. Stress, appraisal, and coping. New York: Springer; 1984. 2. Aldwin CM. Stress, coping, and development. New York: Guilford Press; 1994. 3. DeLongis A, Folkman S, Lazarus RS. The impact of daily stress on health and mood: psychological and social resources as mediators. J Pers Soc Psychol. 1988;54(3): 486-95. 4. Wheaton B. Sampling the stress universe. In: Avison WR, Gotlib IH, editors. Stress and mental health: Contemporary issues and prospects for the future. New York: Plenum Press; 1994. p. 77-114. 5. Pearlin LI, Lieberman MA, Menaghan EG, Mullan JT. The stress process. J Health Soc Behav. 1981;22(4):337-56. 6. Lazarus RS, DeLongis A, Folkman S, Gruen R. Stress and adaptational outcomes. The problem of confounded measures. Am Psychol. 1985;40(7):770-85. 7. Cohen S, Kamarck T, Mermelstein R. A global measure of perceived stress. J Health Soc Behav. 1983;24(4):385-96. 8. Turner RJ, Wood DW. Depression and disability: The stress process in a chronically strained population. Res Community Ment Health. 1985;5:77-109. 9. Cohen S, Williamson GM. Perceived stress in a probability sample of the United States. In: Oskamp S, Spacapan S, editors. The social psychology of health: Claremont symposium on applied social psychology. Newbury Park (CA): Sage; 1988. p. 31-67. 10. Kiecolt-Glaser JK, McGuire L, Robles TF, Glaser R. Psychoneuroimmunology and psychosomatic medicine: back to the future. Psychosom Med. 2002;64(1):15-28. 11. Cruse JM, Lewis RE, Dilioglou S, Roe DL, Wallace WF, Chen RS. Review of immune function, healing of pressure ulcers, and nutritional status in patients with spinal cord injury. J Spinal Cord Med. 2000;23(2):129-35. 12. Cruse JM, Lewis RE, Bishop GR, Kliesch WF, Gaitan E. Neuroendocrine-immune interactions associated with loss and restoration of immune system function in spinal cord injury and stroke patients. Immunol Res. 1992;11(2):104-16. 13. Kliesch WF, Cruse JM, Lewis RE, Bishop GR, Brackin B, Lampton JA. Restoration of depressed immune function in spinal cord injury patients receiving rehabilitation therapy. Paraplegia. 1996;34(2):82-90. 14. Campagnolo DI, Keller SE, DeLisa JA, Glick TJ, Sipski ML, Schleifer SJ. Alteration of immune system function in tetraplegics. A pilot study. Am J Phys Med Rehabil. 1994; 73(6):387-93. 15. Nash MS. Immune responses to nervous system decentralization and exercise in quadriplegia. Med Sci Sports Exerc. 1994;26(2):164-71. 16. Campagnolo DI, Bartlett JA, Chatterton R Jr, Keller SE. Adrenal and pituitary hormone patterns after spinal cord injury. Am J Phys Med Rehabil. 1999;78(4):361-66. 17. Campagnolo DI, Bartlett JA, Keller SE, Sanchez W, Oza R. Impaired phagocytosis of Staphylococcus aureus in complete tetraplegics. Am J Phys Med Rehabil. 1997; 76(4):276-80. 18. Segal JL, Gonzales E, Yousefi S, Jamshidipour L, Brunnemann SR. Circulating levels of IL-2R, ICAM-1, and IL-6 in spinal cord injuries. Arch Phys Med Rehabil. 1997;78(1): 44-47. 19. Frank RG, Elliott TR. Life stress and psychologic adjustment following spinal cord injury. Arch Phys Med Rehabil. 1987;68(6):344-47. 20. Frank RG, Elliott TR, Buckelew SP, Haut AE. Age as a factor in response to spinal cord injury. Am J Phys Med Rehabil. 1988;67(3):128-31. 21. Rintala DH, Hart KA, Fuhrer MJ. Perceived stress in individuals with spinal cord injury. In: Krotoski D, Turk M, Nosek M, editors. Women with physical disabilities: Achieving and maintaining health and well-being. Baltimore (MD): Paul H. Brookes; 1996. p. 223-42. 22. Rintala DH, Hart KA, Priebe MM. A longitudinal study of perceived stress in individuals with spinal cord injury [abstract]. Proceedings of the Department of Veterans Affairs Rehabilitation Research and Development Conference; 2000; Arlington (VA). Washington (DC): VA Research and Development Service. p. 174. 23. Gerhart KA, Weitzenkamp DA, Kennedy P, Glass CA, Charlifue SW. Correlates of stress in long-term spinal cord injury. Spinal Cord. 1999;37(3):183-90. 24. Cohen S, Syme SL. Social support and health. Orlando (FL): Academic Press; 1985. 25. House JS, Kahn RL. Measures and concepts of social support. In: Cohen S, Syme SL, editors. Social support and health. Orlando (FL): Academic Press; 1985. p. 83-108. 26. House JS, Landis KR, Umberson D. Social relationships and health. Science. 1988;241(4865):540-45. 27. Cohen S, Wills TA. Stress, social support, and the buffering hypothesis. Psychol Bull. 1985;98(2):310-57. 28. Norquist GS, Hough RL, Golding JM, Escobar JI. Psychiatric disorder in male veterans and nonveterans. J Nerv Ment Dis. 1990;178(5):328-35. 29. Rosenheck R, Frisman L, Chung AM. The proportion of veterans among homeless men. Am J Public Health. 1994; 84(3):466-69. 30. McKinney WP, McIntire DD, Carmody TJ, Joseph A. Comparing the smoking behavior of veterans and nonveterans. Public Health Rep. 1997;112(3):212-18. 31. Klevens RM, Giovino GA, Peddicord JP, Nelson DE, Mowery P, Grummer-Strawn L. The association between veteran status and cigarette-smoking behaviors. Am J Prev Med. 1995;11(4):245-50. 32. Richards MS, Goldberg J, Rodin MB, Anderson RJ. Alcohol consumption and problem drinking in white male veterans and nonveterans. Am J Public Health. 1989;79(8): 1011-15. 33. Richards MS, Goldberg J, Anderson RJ, Rodin MB. Alcohol consumption and problem drinking in Vietnam era veterans and nonveterans. J Stud Alcohol. 1990;51(5):396-402. 34. Winkleby MA, Fleshin D. Physical, addictive, and psychiatric disorders among homeless veterans and nonveterans. Public Health Rep. 1993;108(1):30-36. 35. Koepsell T, Reiber G, Simmons KW. Behavioral risk factors and use of preventive services among veterans in Washington State. Prev Med. 2002;35(6):557-62. 36. Petersen LA, Normand SL, Daley J, McNeil BJ. Outcome of myocardial infarction in Veterans Health Administration patients as compared with Medicare patients. N Engl J Med. 2000;343(26):1934-41. 37. Langewitz W, Ruddel H, Von Eiff AW. Influence of perceived level of stress upon ambulatory blood pressure, heart rate, and respiratory frequency. J Clin Hypertens. 1987;3(4):743-48. 38. Colby JP Jr, Linsky AS, Straus MA. Social stress and state-to-state differences in smoking and smoking related mortality in the United States. Soc Sci Med. 1994;38(2):373-81. 39. Byrd RP Jr, Krishnaswamy G, Roy TM. Difficult-to-manage asthma. How to pinpoint the exacerbating factors. Postgrad Med. 2000;108(6):37-40,45-46,49-50 passim. 40. Aikens JE, Mayes R. Elevated glycosylated albumin in NIDDM is a function of recent everyday environmental stress. Diabetes Care. 1997;20(7):1111-13. 41. Dailey PA, Bishop GD, Russell IJ, Fletcher EM. Psychological stress and the fibrositis/fibromyalgia syndrome. J Rheumatol. 1990;17(10):1380-85. 42. Holroyd KA, Stensland M, Lipchik GL, Hill KR, O'Donnell FS, Cordingley G. Psychosocial correlates and impact of chronic tension-type headaches. Headache. 2000;40(1): 3-16. 43. Radloff LS. The CES-D scale: A self-report depression scale for research in the general population. Appl Psychol Meas. 1977;1:385-401. 44. Coyle CP, Roberge JJ. The psychometric properties of the Center for Epidemiological Studies-Depression Scale (CES-D) when used with adults with physical disabilities. Psychol Health. 1992;7:69-81. 45. Fuhrer MJ, Rintala DH, Hart KA, Clearman R, Young ME. Depressive symptomatology in persons with spinal cord injury who reside in the community. Arch Phys Med Rehabil. 1993;74(3):255-60. 46. Schulz R, Decker S. Long-term adjustment to physical disability: the role of social support, perceived control, and self-blame. J Pers Soc Psychol. 1985;48(5):1162-72. 47. Cairns DM, Adkins RH, Scott MD. Pain and depression in acute traumatic spinal cord injury: origins of chronic problematic pain? Arch Phys Med Rehabil. 1996;77(4):329-35. 48. Krause JS, Kemp B, Coker J. Depression after spinal cord injury: relation to gender, ethnicity, aging, and socioeconomic indicators. Arch Phys Med Rehabil. 2000;81(8): 1099-109. 49. Roberts RE. Reliability of the CES-D Scale in different ethnic contexts. Psychiatry Res. 1980;2:125-34. 50. Marteau TM, Bekker H. The development of a six-item short-form of the state scale of the Spielberger State-Trait Anxiety Inventory (STAI). Br J Clin Psychol. 1992;31(Pt 3): 301-6. 51. Spielberger CD. Manual for the State-Trait Anxiety Inventory STAI (Form Y). Palo Alto (CA): Consulting Psychologists Press; 1983. 52. White KP, Nielson WR, Harth M, Ostbye T, Speechley M. Chronic widespread musculoskeletal pain with or without fibromyalgia: psychological distress in a representative community adult sample. J Rheumatol. 2002;29(3):588-94. 53. Curran CA, Ponsford JL, Crowe S. Coping strategies and emotional outcome following traumatic brain injury: a comparison with orthopedic patients. J Head Trauma Rehabil. 2000;15(6):1256-74. 54. Diener E, Emmons RA, Larsen RJ, Griffin S. The Satisfaction with Life Scale. J Pers Assess. 1985;49:71-75. 55. Dowler R, Richards JS, Putzke JD, Gordon W, Tate D. Impact of demographic and medical factors on satisfaction with life after spinal cord injury: a normative study. J Spinal Cord Med. 2001;24(2):87-91. 56. Richards JS, Bombardier CH, Tate D, Dijkers M, Gordon W, Shewchuk R, DeVivo MJ. Access to the environment and life satisfaction after spinal cord injury. Arch Phys Med Rehabil. 1999;80(11):1501-6. 57. Dijkers MP. Correlates of life satisfaction among persons with spinal cord injury. Arch Phys Med Rehabil. 1999; 80(8):867-76. 58. Neugarten BL, Havighurst RJ, Tobin SS. The measurement of life satisfaction. J Gerontol. 1961;16:134-43. 59. Pavot W, Diener E, Colvin CR, Sandvik E. Further validation of the Satisfaction with Life Scale: evidence for the cross-method convergence of well-being measures. J Pers Assess. 1991;57(1):149-61. 60. Cohen S, Mermelstein R, Kamarck T, Hoberman HM. Measuring the functional components of social support. In: Sarason IG, Sarason BR, editors. Social support: Theory, research and application. The Hague (Holland): Martinus Nijhoff; 1985. p. 73-94. 61. Newsom JT, Schulz R. Social support as a mediator in the relation between functional status and quality of life in older adults. Psychol Aging. 1996;11(1):34-44. 62. Williamson GM. Extending the activity restriction model of depressed affect: evidence from a sample of breast cancer patients. Health Psychol. 2000;19(4):339-47. 63. Williamson GM, Schulz R. Physical illness and symptoms of depression among elderly outpatients. Psychol Aging. 1992;7(3):343-51. 64. Ward MM. Predictors of the progression of functional disability in patients with ankylosing spondylitis. J Rheumatol. 2002;29(7):1420-25. 65. Baron RM, Kenny DA. The moderator-mediator variable distinction in social psychological research: conceptual, strategic, and statistical considerations. J Pers Soc Psychol. 1986;51(6):1173-82. 66. Binks TM, Radnitz CL, Moran AI, Vinciguerra V. Relationship between level of spinal cord injury and posttraumatic stress disorder symptoms. Ann N Y Acad Sci. 1997;821:430-32. 67. Radnitz CL, Hsu L, Tirch DD, Willard J, Lillian LB, Walczak S, Festa J, Perez-Strumolo L, Broderick CP, Binks M, Schlein I, Bockian N, Green L, Cytryn A. A comparison of posttraumatic stress disorder in veterans with and without spinal cord injury. J Abnorm Psychol. 1998;107(4):676-80. 68. Radnitz CL, Hsu L, Willard J, Perez-Strumolo L, Festa J, Lillian LB, Walczak S, Tirch DD, Schlein IS, Binks M, Broderick CP. Posttraumatic stress disorder in veterans with spinal cord injury: trauma-related risk factors. J Trauma Stress. 1998;11(3):505-20. 69. Radnitz CL, Schlein IS, Hsu L. The effect of prior trauma exposure on the development of PTSD following spinal cord injury. J Anxiety Disord. 2000;14(3):313-24. 70. Kennedy P, Duff J. Post traumatic stress disorder and spinal cord injuries. Spinal Cord. 2001;39(1):1-10. 71. Pakenham KI. Adjustment to multiple sclerosis: application of a stress and coping model. Health Psychol. 1999; 18(4):383-92. 72. Martin Ginis KA, Latimer AE, McKechnie K, Ditor DS, McCartney N, Hicks AL, Bugaresti J, Craven B. Using exercise to enhance subjective well-being among people with spinal cord injury: The mediating influences of stress and pain. Rehabil Psychol. 2003;48:157-64. Submitted for publication October 17, 2003. Accepted in revised form November 8, 2004.